And yet whoever thought of it otherwise? Still sometimes we use logic, as diversion, among the so-called “points,” letting it go. Circular, perhaps, in that way. Much as we’d like to, never quite constructing a web. For capture. Or a moment to observe, re-flect. Rather, more de-flect. If you get their picture. That is, I assume, if for “improvisation” we substitute some creatively imagining wandering – the wonderings of intention or querying of some inceptive experiencing? After a fashion. I’m prone to argue the “point.” I.e., “What/where/when/how – a ‘point’?” Inconceivable for me. As my understanding of ‘point’ is like my comprehension of ‘god’ or ‘time,’ ‘truth’ or ‘being’ – concepts as moving targets without definite characteristics – indefinable insubstantials. 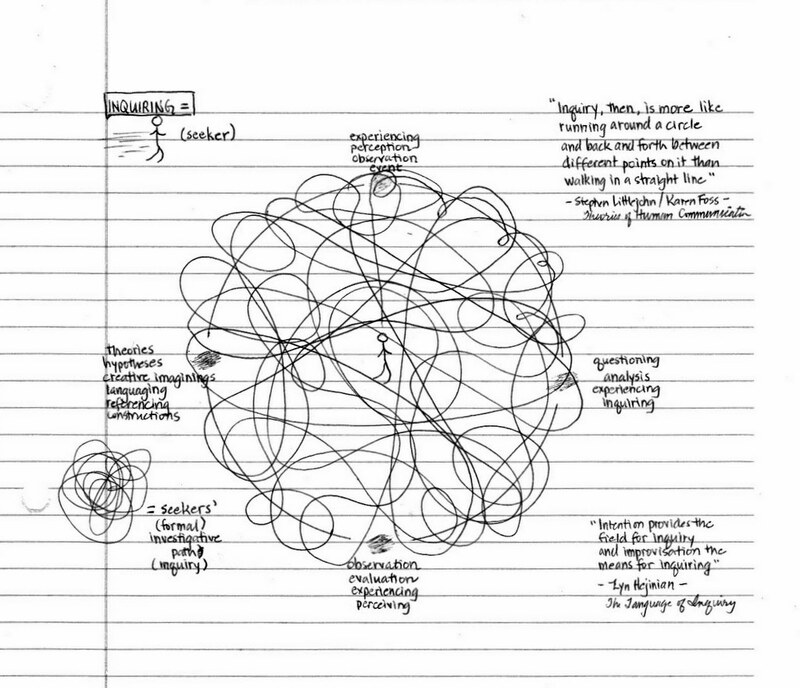 E.g., the falsity of my diagram. It wouldn’t surprise me if I thought of inquiry as motricity. When we intend to inquire we’re moving (point-less) and inquiry moves us (point-less) among (therefore, obviously) moving things (thereby point-less), if only in relation to us. The denial of a dead present. Pointedly. No stasis for the living. Life (logic leads), as, literally, pointless. So how do we refer? Index? Sign? “Point” to – in all this motion? Commotion? …dropping the term “experience” as blatantly false. Not, then, “to question,” but questionING, one and same with observING, evaluatING, inquirING, seekING, readING, creatING, fabricatING the impossibility of a truthful past tense. This writing strikes me as incredibly musical, like a jazz song where the words riff off of meanings and vice versa. But always the core melody/thought. thank you. language kinda works that way through my head. Very well done. An intriguing blend of free verse & prose poem.